Leaky fuel tank.....Look no further! StaraSeal is an easy to use product formulated especially for sealing metal fuel tanks. Simply blend the 2 parts together and tip into your tank, slosh it around to coat all sides. 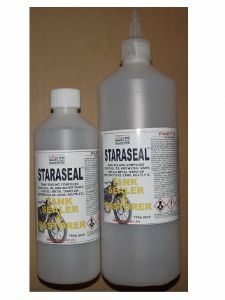 Staraseal will find any leaks and soak deep in between the parts, and coat all surfaces giving a chemical resistant liner to the tank, no edges to lift like a patch this product coats to form a new chemical resistant tank lining, a permanent job...Every time! Many fuel tank sealing compounds are not resistant to high levels of alcohol many will break down with greater than 10% concentration of alcohol in a fuel, blocking filters , fuel lines and pumps etc , StaraSeal will not degrade even with 100% alcohol fuel.